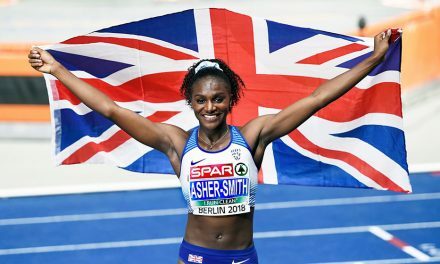 While British eyes were on the ERRA Spring Road Relays at Sutton Coldfield, there were many other notable performances all over the world. 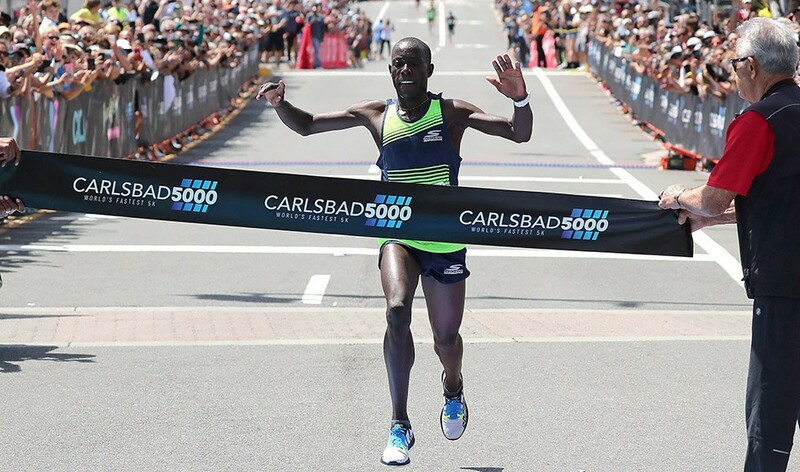 Kenya’s Edward Cheserek won in 13:29 and equalled the world 5km record mark of Julian Wanders set in Monaco. 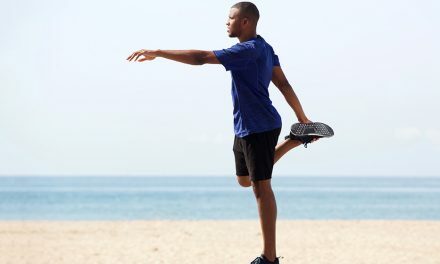 The distance has only been regarded for world records in recent months and faster times set in previous years have been disregarded for record purposes. 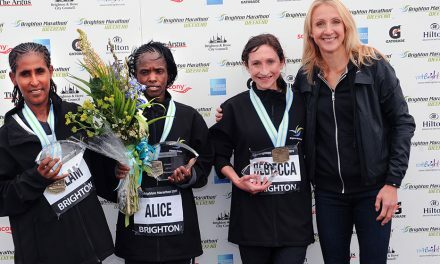 Sharon Lokedi was first woman in 15:48 with Britain’s Charlotte Arter second in 16:01 while further Brits included Alice Wright 16:05 and Jenny Nesbitt 16:38. Newly-crowned world masters indoors M40 1500m champion James Thie won the masters race in 15:48. Rosemary Wanjiru set a world best of 50:42 to eclipse Sonia O’Sullivan’s 51:00 2002 time. It was the Kenyan’s first ever race longer than 10km, as Goytetom Gebrslase in 50:47 and Margaret Muriuku in 51:38 completed the women’s top three. 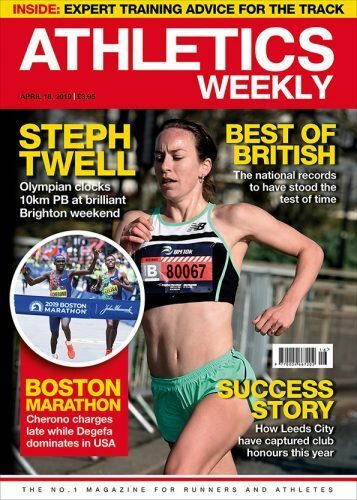 Behind, Steph Twell clocked 52:58 to go No.10 on the UK all-time rankings. In the men’s race, Ethiopia’s Jemal Yimer won in 45:36 to beat Kenya’s Josphat Tanui by a second, with Edwin Kibichiy third in 45:57. In fourth, former Kenyan Stanley Kebenei set a US record of 46:00. 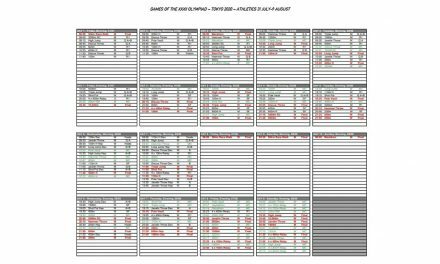 Vasiliy Mizinov, and authorised neutral athlete and the European bronze medallist, won the 87th event in 80:14 with Britain’s Callum Wilkinson sixth in 81:34 which is a UK under-23 record and moves him second all-time among UK seniors behind Tom Bosworth. Italy’s Eleonora Giorgi won the women’s race in 1:27:48 while Heather Lewis was 12th in a PB 1:35:04 which consolidates her position as fifth all-time among British athletes. Chris Snook was second in the under-20 10km in 43:37 which puts him third all-time among UK juniors. 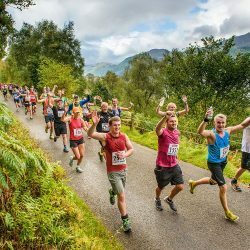 There were 13095 finishers in the event and Jenny Spink won the women’s race in 2:35:19 with Fanni Gyurlo second in 2:39:51. The first man to finish was Aaron Richmond of Bideford in 2:21:34 with Gareth Raven second on 2:26:07. 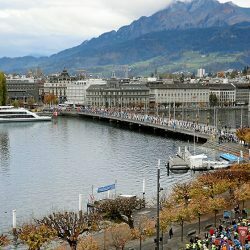 Simon Lawson won the wheelchair marathon in 1:31:52. Top M40 Nick Torry won the men’s race in 65:34 by over a minute as Eilidh Bell won the women’s race in 79:03. Ahmed Abdulle won the men’s race in 25:19 with Paul Martelletti third in 25:49 having warmed up with 10 miles at the same pace as he did a marathon-paced run. Annabel Gummow won the women’s race in 28:09. Kenya’s Marius Kipserem broke the course record with a 2:04:11 PB made up of 62:17 and 61:54 half-marathon splits. Kaan Kigen Ozbilen went second on the European all-time list behind Mo Farah with a Turkish record 2:05:26. Kenyan Emmanuel Saina was third in 2:05:42 while Abdi Nageeye smashed the Dutch record with 2:06:18 to finish fourth and move to fourth on the European all-time list. European champion Koen Naert just missed the Belgian record but was seventh in a PB 2:07:39. Ethiopia’s Ashete Bekere won the women’s race in 2:22:55 ahead of Kenya’s Stella Barsosio (2:23:37) and Aliphine Tuliamuk from USA (2:26:48). Benard Kimeli defended his title in a fast 59:07 and took 40 seconds off his PB as he defeated Felix Kibitok by a second and led a Kenyan sweep of the top five. Stephen Kiprop was third in 59:20. Caroline Kipkirui won the women’s race in 65:44 half a minute in front of European 10,000m champion Lonah Salpeter, whose 66:09 was an Israeli record. Titus Ekiru with an even 2:04:46 and Vivian Kiplagat (2:22:55) broke the Italian all-comers’ records. Evans Chebet (2:07:22) and Edwin Koech (2:08:24) completed a Kenyan men’s clean sweep while Kiplagat won by more than 10 minutes ahead of team-mate Joan Kigen (2:32:32). Kenya’s Filex Kipchirchir broke the course record with a 2:05:33 ahead of Ethiopia’s Shiferaw Tamru Aredo (2:06:21) with Uganda’s Fred Musobo third in 2:06:55. Kenya’s Pamela Rotich won the women’s race in 2:28:10. Kenya’s Nancy Kiprop won her third title, breaking the long-standing course record with 2:22:12 ahead of team-mates Angela Tanui (2:25:37) and Maurine Chepkemoi (2:26:16). In the men’s race, Kenya’s Vincent Kipchumba won in a PB 2:06:56 to defeat Switzerland’s Tadesse Abraham (2:07:24). Tebalu Zawude won an Ethiopian-dominated race in 2:08:37 while Megertu Alemu won the women’s race in 2:22:52. Kenya’s Racheal Mutgaa broke the women’s course record in 2:26:15 while Silas Mwetich (2:09:37) won the men’s race. European 5000m champion Sifan Hassan won in 65:45 as she won by more than three minutes. The Dutch athlete went through 10km in 30:51 but drifted off world record pace in the latter stages. Kenya’s William Wanjiku won a three-way sprint finish for the men’s race in 61:00. Ruth Chepngetich went 11th on the world all-time list with a 65:30 women’s victory. Fellow Kenyan Dorcas Jepchirchir was second in 66:33 with Ethiopian Helen Tola third in 66:45. Kenya’s Benard Ngeno won the men’s race with 59:56, two seconds ahead of Ethiopia’s Abayneh Degu, with Kenyan Hillary Kipchumba third in 60:01. Guesting world champion Tom Walsh of New Zealand won the shot put with world-leading 21.91m while Naa Anang took the women’s long jump with a wind-assisted 6.88m but also did a legal 6.81m to top the world rankings. Lauren Wells won the 400m hurdles in 54.87 beating Portia Bing who clocked a New Zealand record of 55.86. New Zealand 17-year-old Eddie Nketia won the 100m in 10.22 after a national junior record of 10.19 in the semi-final. Chloe Tighe, a Herne Hill Harrier with a British coach (Geoff Jerwood), won the 1500m in 4:11.74. At the Australian Track & Field Championships the Men’s Open Shot Put is underway. 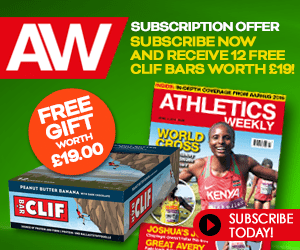 There were 10km wins for Silas Kipruto (27:58) and Monicah Ngige (31:37). There was a world-leading 12.87 in the 100m hurdles for Chanel Brissett of the United States. USA’s Gwen Berry set a world-leading women’s hammer mark of 76.23m. There was a world lead in the women shot for American Chase Ealey who threw 19.67m. 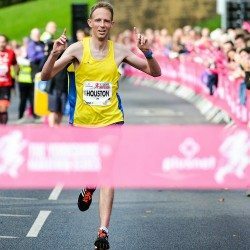 M35 Richard Mair was the men’s winner in a fast 31:38 while World Championships marathoner Alyson Dixon was a clear women’s winner in 33:28. World masters 1500m and 3000m champion Guy Bracken was first M55 in 34:31 while M75 1500m champion Victor Shirley was another back in action a week after winning gold in Poland as he triumphed in 45:27. Multiple world champion Angela Copson – her range stretches from 400m to 10km – won the W70 gold in 45:05. Other male age group winners included M40 John Butters (33:08), M45 Terry Scott (31:48), M50 Lee Bennett (33:55), Alastair Walker (35:18), M65 Stan Owen (39:14), M70 Alex Sutherland (40:56), M80 Walter Ryder (62:35) and M85 James Pittillo (64:59). Other female age group gold medallists were W35 Elizabeth Renondeau (35:45), W45 Kathryn Stevenson (39:30), W50 Kath Davis (38:55), W55 Wendy Roethenbaugh (40:39), W60 Maggie Loraine (44:17), W65 Dorothy Kesterton (45:13). Phil Healy won the women’s 200m in 23.04 and the 100m in 11.51. The fastest men’s time was by Andrew Heyes with 14:18 at Bakewell while the fastest woman was Naomi Taschimowitz who ran 16:44 at Hackney. 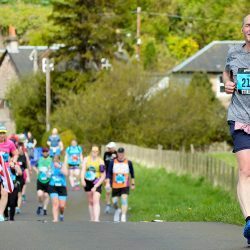 The top age-graded run was by W65 Jeanette Craig who ran 22:12 at Springburn in Glasgow and achieved a 98.65% age-grading.